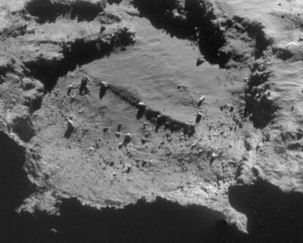 In the preparation to Wednesday’s landing of Philae on Comet 67P/C-G, Rosetta’s science team has released a great image of the landing site, shown above. To the right is a higher resolution inset of the site itself, with the smallest object visible about 8.5 feet across. Looking at this inset, there are some obvious worries that we all should be aware of prior to the landing attempt. Though the Agilkia landing site is generally more smooth than most of the comet’s surface, it still has significant hazards. The lower part is strewn with boulders and rocks, many of which are quite large. Any one of these could do serious harm to Philae should it land on them. Even more interesting is the upper part of the landing site. Though very smooth, the image suggests to me that this is a very thick pile of softly packed material. Philae might land there and quickly sink below the surface, where its cameras will be able to see nothing. Nonetheless, the science team has also released this outline of Philae’s science timeline after landing. The lander will also be taking images of both Rosetta and the comet during its descent, so even if the landing is a failure we will still get some worthwhile data.